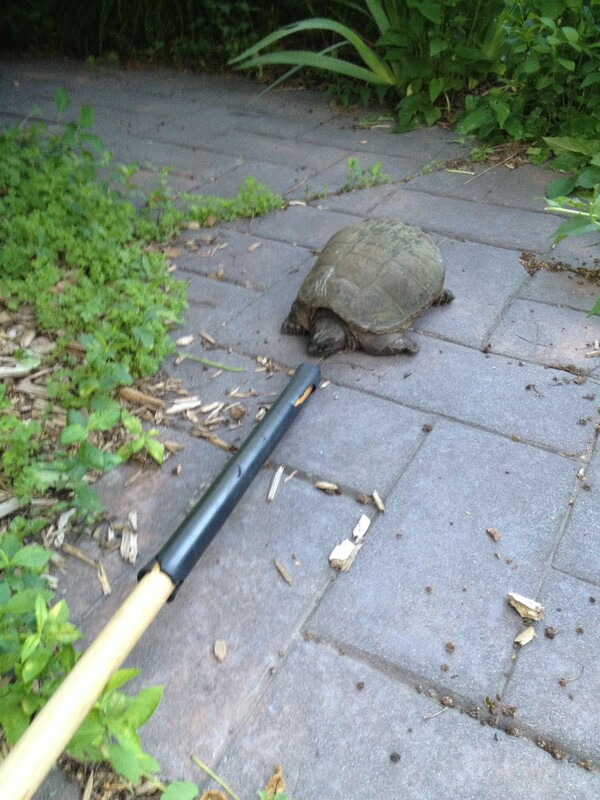 A turtle showed up on our front walk last night. She was off to the side, but on a part of the path that Marc and I had both walked on recently. Me, fifteen minutes earlier; He, just moments before. She might have been a snapping turtle. She might not have been. Regardless of the title, she snapped at the broom he held in his hands. And she snapped at the piece of wood he used to coax her into the garbage can. He walked her through the back yard and into the brush pile that borders the wetland at the back of our property. Until two days ago it was just that, a wetland full of tall grasses, deer and coyotes, and apparently turtles. Now it’s a legitimate swamp or pond – pick your term. So, turtles, deer, hummingbirds… they’re all pointing to one thing. That summer is here. And today, it finally is. And it is here, today, on June 21, 2014, the first day of summer, that I’m declaring that I’m a Writer. And to prove it, I’m going to write every day of this damn summer. I hope to share most of them here. Because that will hold me accountable. But I’m not going to make myself crazy. And I’m not going to poke a large snapping turtle with a broom and force her into a garbage can and carry her to the back yard. Because that’s just plain scary.